Prophet Bushiri’s church in Botswana has been banned by the government over the violation of financial regulations in a suspicious money scheme. The Botswanan government has closed down a church owned by flamboyant pastor, Prophet Shepherd Bushiri, Zambian Observer reports. Botswana’s Minister Batshu says the ECG church has been closed for its continued violating of the law in terms of fake money. 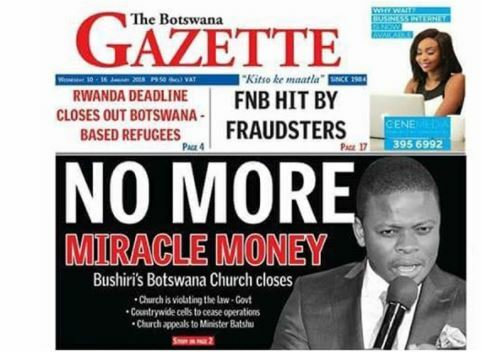 It is alleged that Bushiri’s church is involved in miracle money that the Botswana government considers illegal. The Minister says no ECG branch will operate in Botswana. However ECG Church officials in Botswana have appealed to Minister Batshu to reconsider the decision.